Taichung's notorious air pollution is mostly blamed on activity at its large-scale coal-fired power plant. 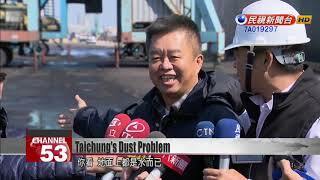 But residents of the area surrounding Taichung Port say there's another culprit - cement dust. The locals have filed complaints about the dust coming in from cement cargo that's shipped to the port. Locals say the dust falls on their homes and ruins the air, and they're demanding a solution for their neighborhood. Since its grand opening at the end of the last year, Taichung's Mitsui Outlet has been a popular local attraction. Little do shoppers know that 2 kilometers away at Taichung Port, ships bring in cement that's stored without a dust collection system. If the cement is not kept in a closed space, and they're handling that cement, that's a terrifying prospect! That cement is transported from here to there, and it raises a lot of dust. No dust is raised. No dust touches the ground. You see for yourself. There's nothing but water on the ground. The cargo handling company said the dock is sprayed with water to reduce dust deposition. But the port's dust problem has already caught the attention of Taichung's environmental protection authority. We are demanding an enclosed, warehouse-style, environmentally friendly space for cargo handling. That is our one demand on Taichung Port. Any time a cargo ship comes into the port, we'll be watching. At present, the penalty is NT$100,000 to NT$5 million. The cement importers themselves do not wish to be punished. I believe all our companies do have the heart to improve. The administrators of Taichung Port said they are working with the import companies on an improvement plan to bring the harm of cement dust to its minimum.